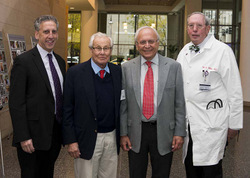 From left: Daniel Linzer, University provost, Laszlo Lorand, PhD, professor emeritus in Cell and Molecular Biology, Robert Goldman, PhD, chair of Cell and Molecular Biology and Eric G. Neilson, MD, vice president for medical affairs and Lewis Landsberg Dean, at a biomedical symposium honoring Lorand for his nearly 60 years of research at the University. 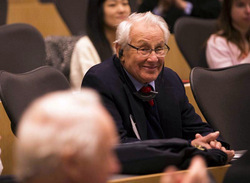 A group of preeminent scholars joined University leaders, distinguished guests and current faculty to honor Laszlo Lorand, PhD, professor emeritus in Cell and Molecular Biology, at a scientific symposium held Friday, Nov. 22. Having joined Northwestern University Feinberg School of Medicine in 1993 after nearly four decades with the Department of Chemistry and what is now the Department of Molecular Biosciences, Lorand helped eliminate the distance between each campus through biomedical collaboration. He also helped recruit some of Northwestern’s most influential leaders. Touching on subjects that ranged from molecular cardiology to pathology, biochemistry and the intricacies of blood coagulation, each of nine presenters offered the audience an in-depth look at their research. Lorand, who obtained an absolutorium in medicine from the University of Budapest and a PhD in Biomolecular Structure from Leeds University, taught Physiology and Pharmacology at Wayne State University School of Medicine prior to joining Northwestern. He was instrumental in securing National Institutes of Health (NIH) support for an extension to the Tech building on the Evanston Campus, was the first director of an NIH-funded Biochemistry Training Program and became a founding member of the new Department of Biochemistry, Cell and Molecular Biology. In 1993, he transferred to the medical school as a research professor of Cell and Molecular Biology and became a distinguished investigator of the Feinberg Cardiovascular Research Institute. Dr. Lorand is credited with promoting cross-campus collaboration between the Evanston and Chicago Campuses. He spent nearly four decades with the Department of Chemistry and what is now the Department of Molecular Biosciences before transferring to the medical school. Lorand is an elected Member of the National Academy of Sciences, a fellow of the American Academy of Arts and Sciences and a foreign member of the Hungarian Academy of Sciences. He has received numerous awards and honorary degrees throughout his career and is the author of more than 200 scientific publications. His research in the area of thrombosis, protein associations and calcium ions is considered to have had a major impact in the field of blood coagulation. For his part as a teacher and mentor, Lorand is recalled by many for having played a vital role in their own careers. The last presenter of the day was Nobel Prize-winning chemist Avram Hershko, MD, PhD, distinguished professor of the Rappaport Faculty of Medicine at the Technion Israel Institute of Technology. He was followed by another of Lorand’s recruits, Robert Goldman, PhD, chair of Cell and Molecular Biology, who offered closing remarks.